The objective of this book is two – fold: to acquaint the visitor with the history, culture, long tradition, lores and the beauty of this captivating land called “Hellas / Greece”, on the other hand, to provide relevant information in order to make this tour as exciting, exhilarating, enjoyable and as worry-free as possible. 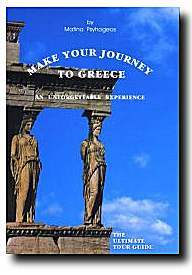 It has been designed to accommodate by presenting facts and recommendations necessary to anyone visiting a foreign country (i.e., a summary of Greece’s long history, everything needed to communicate in the native tongue and all that is required for a wonderful, indeed unforgettable Bon voyage! journey).